Janeth Vela’s first experience with Goshen College began when she started taking piano lessons in GC’s community music program at the age of six. She graduated in 2017 with a nursing degree and played soccer for the college. 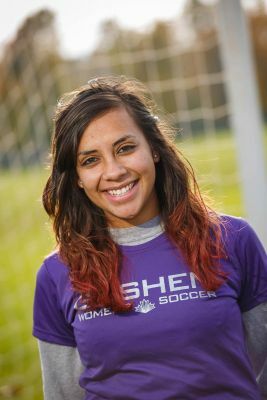 One of the reasons I chose Goshen College was soccer. Soccer is a big part of me, so having the opportunity to continue playing after high school was exciting. Another reason I chose Goshen was because I had heard the nursing and science programs were really good here, and both were my top choices for majors, so it just seemed like the right fit. Finally, it was because it is close to home (about 10 minutes away), so I could stay close to my friends and family. What has kept you at Goshen College? One of the things I really love about Goshen College is the people. The professors are so easy to communicate with, and they’re always ready to clarify things for you. I also enjoy the high diversity on campus because I have the opportunity to learn about lots of different cultures all around the world. With my degree I hope to continue my education and potentially become a physical therapist. My main goal would be to specialize in pediatrics, but I would not mind working with people of all ages.